Cells replicate by dividing, but scientists still don't know exactly how they decide when to split. Deciding the right time and the right size to divide is critical for cells – if something goes wrong it can have a big impact, such as with cancer, which is basically a disease of uncontrolled cell division. Several factors are thought to play a role in a cell's decision to divide, including the size of the cell, the time of day, and cues from the environment, such as the amount of light. Cells, and whole organisms, respond to the time of day in a pattern according to their internal 'circadian clock'. For example, in mammals the circadian clock controls cell regeneration and the release of hormones, and in plants it controls flower opening and photosynthesis. 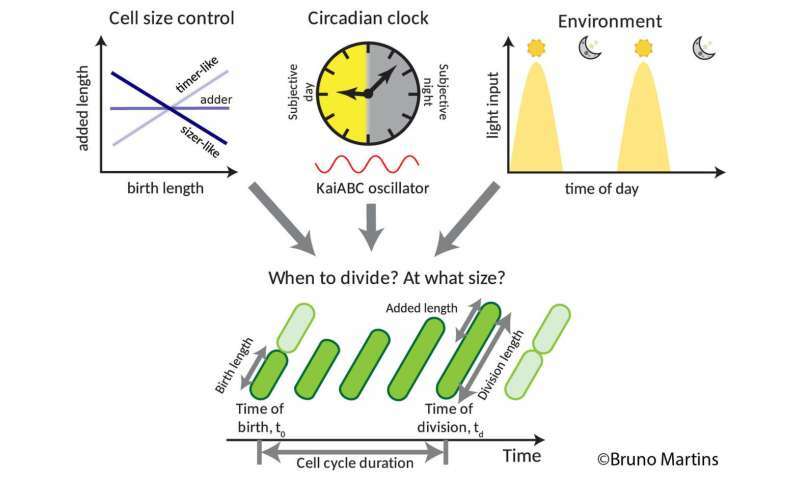 This finding rewrites the most recent understanding that the clock was only acting as an 'on/off' switch to cell division – enabling cells to replicate only at set times. In the subsequent experiments, the team found that rather than the circadian clock acting like an on/off switch or 'gate', forbidding cell division at certain times, it acts to fine tune the process by decreasing division at certain times and accelerating it at others. Dr. Philipp Thomas, from the Department of Mathematics at Imperial, said: "Instead of acting as a strict gate for cell division, the circadian clock constantly influences the division rate throughout the day. Unpicking the complex interactions between cell size, clock and environment was only possible through the careful combination of experiments and iterative models that determined the contribution of the factors at play." Lead author of the study, Dr. Bruno Martins from the University of Cambridge, said: "Cells born in the early part of the day grow to a smaller size before dividing again, because they seem to be in a 'rush' to divide before the end of the day. In contrast, cells born later in the day are in less of a 'rush', and therefore they grow to a bigger size, and avoid dividing in the period that normally corresponds to darkness at night."